Bowen goes to the depths of Asgard to bring us Hela! I’ve mentioned before that the great folks at Statue Marvels regularly do Non-US collectors a huge service by helping us get a hold of exclusives from the Bowen Designs website, which sells to the US only. 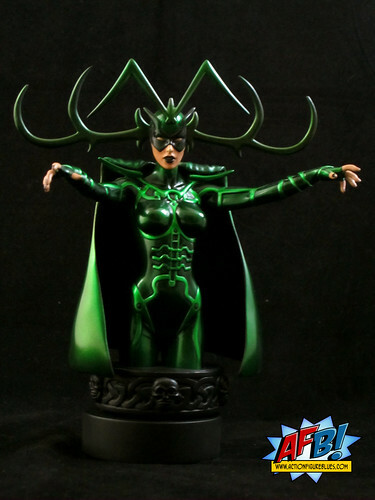 The most recent piece I’ve received with their help is the Bowen Exclusive Hela Mini-Bust, which was released earlier this year. Hela is another great addition to the Bowen Asgardian ranks, with the Warriors Three, The Enchantress and Beta Ray Bill all coming in one form or another in the last year or so and new Museum and Action Thor Statues on the way. It’s a good time to be a Thor fan and a Bowen fan! The first thing to say about the Asgardian Goddess of Death is that there’s not much “mini” about this bust. Thanks to her expansive headdress, Hela is more definitely a “wide load” bust - be prepared for a larger than average box and a bust that will need plenty of display room! The headdress is beautifully sculpted, and while I wouldn’t want to test the materials with harsh treatment, they do have a bit of give so the “branches” of Hela’s ornate headpiece are unlikely to be snapped off by a slight bump. This is another Mike Cusanelli sculpt. Cusanelli has worked on several Bowen ladies of late, and once again has done a very solid job. Hela’s costume has appeared in many, many forms, and while this isn’t the classic light green and black gear, it also isn’t one of her more revealing modern costumes. This is more of an armoured look, and the detail on this piece is stunning, with the ridges of Hela’s costume clearly defined. Paint work on this bust is flawless. The colour choices are pitch perfect, with the greens complimenting each other very nicely. 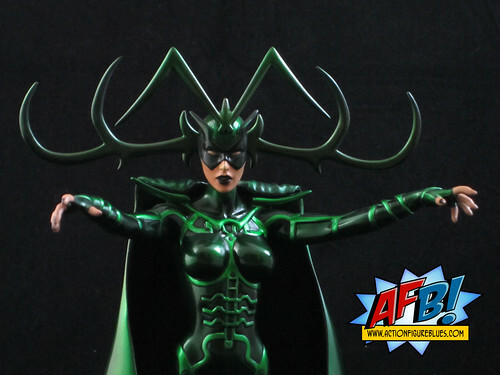 The thin ridges on Hela’s costume could create an issue for a lesser paint job, but this is beautiful work. The metallic edge to the paint really lifts the entire piece to another level. I’ve had cause a few time to rag on Cusanelli for his posing, and I do have to make a little comment here. I find many of his arm and hand poses lacking in energy, and there is an element of this here as well. I’m not sure if it’s the angle of the arms or the position of the hands, but the pose doesn’t end up looking as powerful it should. 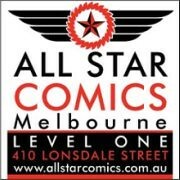 It’s a minor complaint, and a giant step up from the rather awful Firestar bust, but still something I’m disappointed to see recurring. The second small issue is the base of this piece. In an unusual move for Bowen busts, Hela comes with a fairly low base, and then a disc of the same size to stand it on for more height if desired. In terms of where I would like to place Hela in my Asgard bust display, she still comes up a bit short with this extra height, but seems likely that a taller base would have made a piece so wide unstable, so a lower base with options for height is a nice touch. I’m sure we have the Thor movie to thank for this recent run of fantastic Asgardian characters from Bowen. Whatever the cause, I’m very grateful! Now we really just need the previewed but not yet solicited Sif bust to complete the cast! Within are three officials, whom Gylfi in the guise of Gangleri is allowed to question about the Asgard and the Æsir. A revelation of the ancient myths follows, but at the end the palace and the people disappear in a clap of thunder and Gylfi finds himself alone on the plain, having been deluded. Bowen really has the paintwork down perfect! Beautiful! Very nice but i kind of wish it had her full body on it.